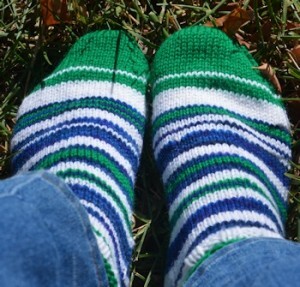 Yesterday, July 31, I finished the sixth pair of "sporty-shorty" summer socks for 2015. One to go, before going back to longer socks. 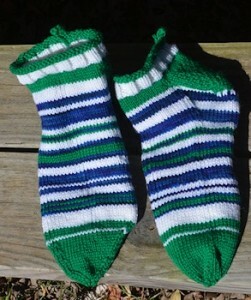 This pair combined two "leftover" yarns from longer socks. The green is Ella rae Classic, color #90, which is actually more emerald than the picture shows. The blue is Cascade 220 Paints "Isle of Sky," unfortunately a discontinued color. 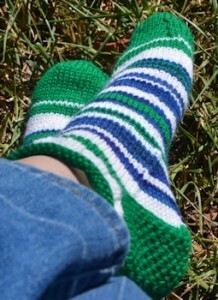 The white, bought for striping, is Cascade 220. The variation in "Isle of Sky" shows up better from this angle: it's subtle, and lovely. L: subtler variations of non-matching stripes. R. Closer look at the "Eye of Partridge" heel. The last pair of these shorties for now is about to be cast on (after a nap--this weather!!) and will be the opposite of the 4th of July pair: top, heel, and toe will be red, and the stripes on the foot will be blue & white. Reading the colors from the top, it really will be "red, white, and blue" so that will be its name. Why that? Because, having made two pairs of solid red socks earlier in the year, I have plenty of leftover red yarn to use up. I had quite a bit of green, so...these were "framed" in green. Then it's immediately on to taller socks. One for me, one for a friend, the more for me later. Counting socks finished this year (though two pairs were started late last fall) I've knit seven pairs of crew socks with taller cuffs (six for myself, one for a friend) and six of the shorties. And socks have worn out since the start of the year, too, from the first year and half of sock making. Pretty much expected. I tried to link to a photo I'd posted over on my own Journal of a DIY yarn caddy that looked really useful for socks projects like you do, only that didn't work. So I'm just linking to my post rather than trying to link to the actual picture. That's a clever idea--thanks for the link and a picture. I've thought of making something like a hanging device with a holder for each color, that could be rotated whichever way will keep the yarns untangled, but I suspect (given my "success" with mobiles in the past) that I could create a monster, Either it would fall out of the ceiling onto me, shedding balls of yarn as it came, or it would make tangling worse. When I have only two yarns "going", I can put them both in one plastic bag, side by side, and just flip the bag back and forth when I change colors. With three or more, I have to turn the work upside down at times and rotate IT, or pick up balls and work them through the strands from other yarns until it's clear. I like this fresh, vibrant colour mix. I like that it will bring you memories of a cooler environment. Thanks. Have to admit I'm really happy with this pair too. link to an Amazon listing of some yarn that glows in the dark. That might be fun in socks to wear at conventions. Great minds--someone else sent me a link to that. I was thinking it would be (if thicker yarn) good for strips that could be used in a guest-room to mark the closet door, bathroom door, or any immovable obstacles someone might bump into in the dark.